Home » News » First Grade Loves to Read! First Grade Loves to Read! Quiet reading is always a much-anticipated activity in first grade. 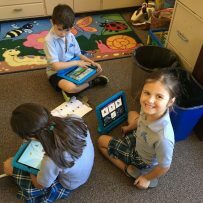 Some students choose to read books available from the classroom library, while others opt to work on the iPads using a new reading app called Lexia. Lexia enables at-risk, on level, and advanced students to each work at their own pace via an engaging and motivating online experience. Using Lexia, students are automatically placed at the proper level and work independently in the online activities to develop their skills in the six areas of reading. We LOVE reading in first grade!